WE ARE POP SQUID MKG. Pop through the clutter. Enjoy inspired support. We are a New York City based boutique digital marketing + branding agency that serves as an on demand partner for businesses across industries. Pop Squid MKG is a fast and responsive one-stop shop that creates transformative strategies for our clients, while remaining highly accessible and accountable along the way. SAY YES TO THE POWER OF THE POP. 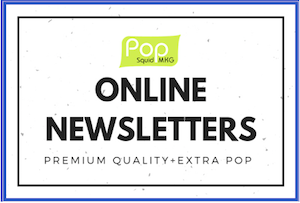 Let Us Design & Manage Your Online Newsletters. Do You Need To Build A New Brand From The Ground Up?